'What aspect of the air strikes would make it possible for a voter to change her mind?' asks Aakar Patel. The Indian attack on Pakistan is being bandied about as the thing that will swing the election in favour of the prime minister. The nation, or large parts of it, was dismayed by the pusillanimity that was shown by earlier governments against Islamabad and its puppets. 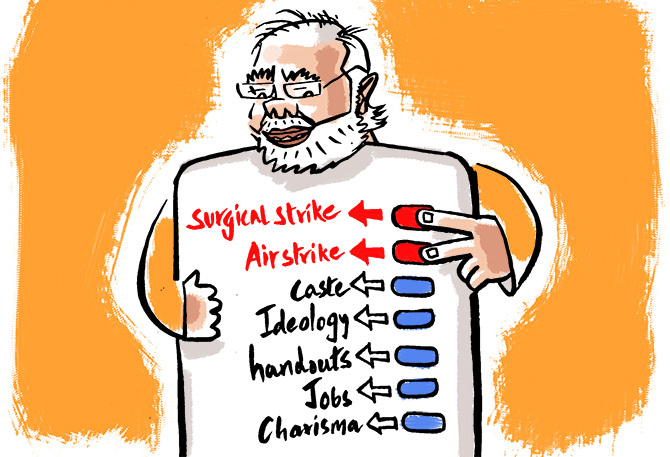 The airstrike at Balakot has changed that and it will redound to the credit of the strong leader. This is the thinking. To me it will be interesting if this is the case and if, after the election is won, we can see some data that conclusively shows that for most, or many, people this was the moment when they decided to vote in the way that they did. The question to ask is: What is it that we vote for? In India the answer that most psephologists and sociologists will give is that we vote for tribal identity. For example, Patidars vote for Patidar interests, and the party and candidate that best represents these interests then becomes the choice for many people in the community. Not all, of course, because that is not possible and it is not how free choice works. But data indicates that caste groupings is the most popular and widespread way in which the voter votes and parties allot tickets to candidates. The other thing we vote for is ideology, though the evidence for this is weaker. We do not have many political parties that have an ideology other than, to some extent, the Communists and the Bharatiya Janata Party. The Communists, even when they take power in the states, are unable to implement the full spectrum of Socialist policy, even the bits that they are in control of, because total ownership by the State of production is no longer seen as possible or desirable. The Communists may be up to speed with their dogmatic material, but they have not been able to use it to any great extent, especially in the last 20 years. I think of the BJP as being only a sort-of ideological party because its ideology is expressed negatively. Politically, it wants Muslims to surrender their mosque, give up their family laws and hand over their Constitutional autonomy in Kashmir. These have been its three primary planks. After taking power, it has ordered Muslims to give up their diet, to demonstrate their citizenship in Assam (where 99 per cent of the excluded are Muslims), to repeat the Hindutva slogans in public, to let go of their university autonomy and so on. As may be noticed, this particular ideology does not seek anything in particular for itself or its followers; it only wants to intrude into what others should do or should not do. To me that is not an ideology, but I accept that it may be for some people who would want to vote on the basis of this thinking. The third thing that comes to mind is that parties make certain promises that are attractive to the voter. They could be the basic handouts like television sets and mobile phones or something more substantial like the MNREGA scheme, which guaranteed 100 days of paid work for those in need of it. Sometimes the promise is not made in the election, but it comes anyway, as is the case of the PM Kisan scheme, which gives Rs 6,000 to families owning five acres or less of agricultural land. The fourth thing is promises not about something that will come to the voter directly but indirectly. I have always been sceptical about people voting for or against parties on the basis of job promises or delivery because we do not have evidence to show that it motivates the voter in the same way as the direct handout does. What does not affect the individual directly and tangibly is not easy to pinpoint as being a significant factor when exercising franchise. The fifth thing is individual leaders, some of whom are liked because of their charisma. While it is true that such leaders have to fall within the framework of the things listed above, they still have some space to be able to express their personality in a way that citizens will find attractive. We can put some leaders of the past and the present in this category. But I am unsure of how it affects voting. A leader may be popular nationwide, for example, but his party may only be competitive in the north and not the south, as was the case, say, with Atal Bihari Vajpayee. Does that mean he is less popular in the south or that the popularity does not result in votes? It is not easy to tell. But the fact is that we do not have any party at the moment that is popular across the nation. These pretty much are all the reasons that I can think of for why we vote. The idea that the airstrikes are significant is, as you can see, excluded from the list. What aspect of the strikes would make it possible for a voter to change her mind? I am unable to understand that. Those who say 'We have finally taken strong action' assume that this is something that is playing on the minds of individuals voting for a government for the next five years. I would like to know how they have come to this conclusion, because I must confess I do not know. And I will wait with bated breath to see whether it is the sort of thing that can swing an election.